The university is a month away from closing the door on a $125,000 project to replace the locks on all the buildings on campus. Completion of the first campus-wide re-keying project is scheduled to end in late February to early March after the locks are changed in Mary Couts Burnett Library, the Student Center and Ed Landreth Hall. Sophomore business major Chris Niemczyk winds up to fire a snowball near Frog Fountain. 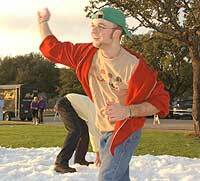 The $7,000 party created a winterwonderland Wednesday in front of Frog Fountain. In his recent State of the Union Address, President Bush called on Congress to renew the Patriot Act, granting law enforcement agencies, such as the Federal Bureau of Investigation, extended abilities to fight terrorism. A December Chicago Tribune story explored an up-and-coming format of music: the video game soundtrack. While the graphics and game play of modern video games and their systems have evolved since Pac-Man, the music of the modern video game has also grown to new levels. Despite the advances in video games and their music, American culture still snubs its artistic beauty. It is rare in any sport for a one-loss team to consider themselves underdogs at a home meet. Though, for the mens swimming and diving team, its just that. Fresh off their first loss of the season last Saturday to No. 5 Florida, the Frogs (8-1) plan to play the role of spoiler tonight when they host Southern Methodist University.